Quite some time has passed since Tony Stark made his identity as Iron Man public, and now he hopes to bring free renewable energy to nations around the globe by building arc reactors on a much broader scale. One such nation to see the installation of an arc reactor is Japan. Stark sets up shop - a little home away from home - to oversee the final stages of the arc reactor's completion. He also wants to test out new Iron Man Dio armor suits, which will be worn by younger pilots, as he seemingly intends to retire his career as Iron Man once his plans with the arc reactor have been completed. However, the honeymoon status only lasts so long, and the Iron Man Dio suits are overridden by some outside force. They leave Stark's lab and as he attempts to track them down he comes face to face with the first robotic member of Zodiac. Stark quickly realizes there is something larger at play than he originally anticipated, and both ghosts from his past and new threats will face him before the record is set straight in Japan. In typical fashion, Madhouse has done a knockout job with the animation. There is a great blend of 2D animation with cel-shaded 3D models that help bring out more dynamic panorama views and action-packed fight sequences. The Iron Man suit itself has plenty of detail up close, and the energy blasts from his palms look cool each time he fires them off. Aside from peeling back layers of the Zodiac mystery, Tony Stark spends his time in Japan constantly crossing paths with a peppy (if not unlucky and mildly annoying) reporter named Nanami and trying to seduce his head researcher Dr. Chika Tanaka. Neither one of these subplots is particularly well-written, and might have better been scripted as minor side stories for a single episode. Instead, they tend to bog down the fun and excitement in Iron Man with sappy melodrama. The anime is full of cliché subplots that could easily fit into any other generic anime if you were to remove Iron Man from the lead role. A few of the overarching storylines that run for multiple episodes are interesting enough, and Tony Stark's past as well as his friendship/rivalry with handsome Japanese hero Captain Nagato Sakurai help to best develop him as a character. Sakurai and Stark are the most well-rounded characters in the show, while the major villains are guided by boring and highly illogical ideologies. The Zodiac suits are there more or less to beat Iron Man senseless before the superhero eventually gathers his bearings and they are blown up in spectacular fashion The show seems to forget just where it was planning to go originally, as the final episodes are a huge departure from the introductory ones. The dialogue ranges from halfway decent to bland and uninspired. One brief appearance by Wolverine acts as a plug for Marvel and Madhouse's other anime works, but this story is otherwise concerned entirely with Iron Man. The story is at its best when it runs a plot line over the course of a few episodes, building up the tension and sense of intrigue. As a whole, it is not particularly well-scripted, but there have also been far worse offenders in the field of tie-in anime projects. 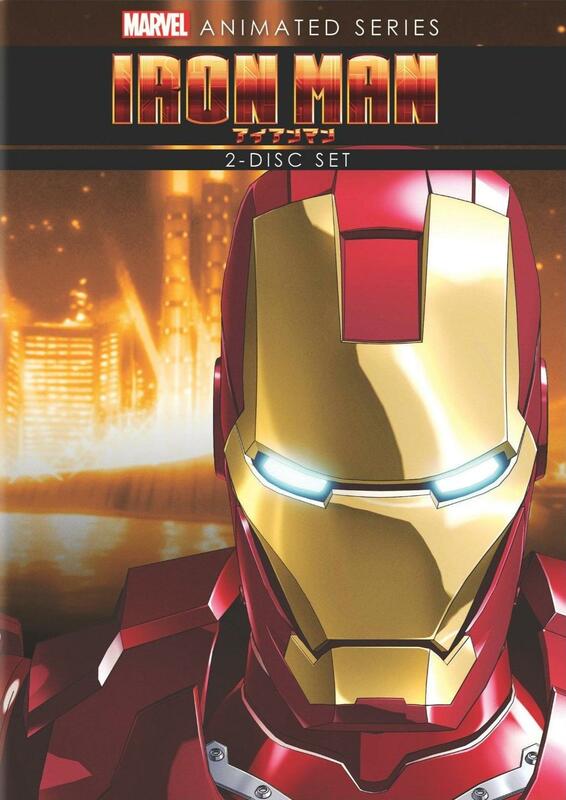 This is an anime aimed strictly at Iron Man and Marvel fans, and does not rank particularly close to the quality of the comic books and movie franchise that inspired it. A lot of sinister things have been done over the years in the Resident Evil games. It's really no surprsise - I mean, the series has 'evil' in its name. Sure, exposing people to a virus that turns them into a mindless horde of flesh-eaters is pretty bad behavior. But abominations like the Hunters and Novistadors and truly vile; don't even get me started on Wesker and his little Uroboros pet project. 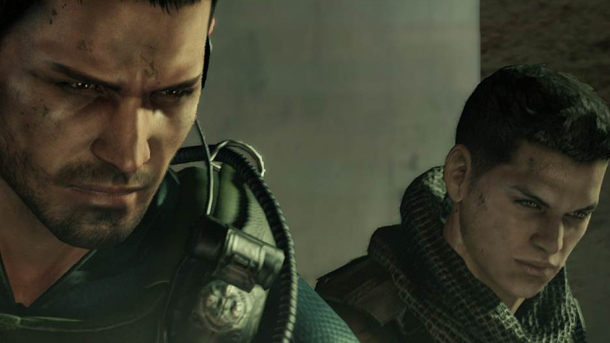 This list is a compilation of the five moments I found best put the 'evil' in Resident Evil 6. Be warned: this list is filled with spoilers, so if you don't want your RE6 experience ruined, play through the game first and then come back to compare notes with me. 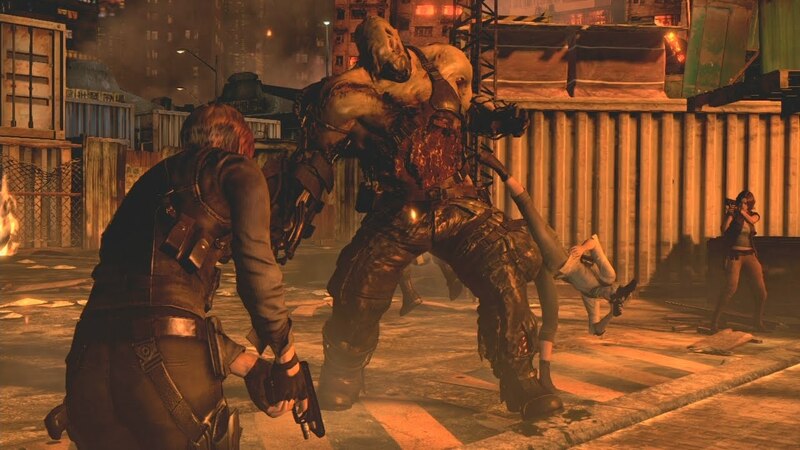 #5 - Zombies with guns: Don't get me wrong, I loved the way in which the J'avo were implemented into Resident Evil 6. Having squads of tactical and organized zombies is great, and the fact that they are stronger than run-of-the-mill infected makes for much more interesting (as well as tense) combat. But seriously, who was the idiot at Neo Umbrella that thought it would be a good idea to give zombies guns? They weren't dangerous enough with the whole flesh-eating routine? Not to mention that their body parts mutate into some heavy and quite practical weaponry. #4 - Pong torture game: Just before Chris and Leon have their standoff over (impostor Ada Wong) Carla Radame's fate, the two find themselves in a security room, their identities protected thanks to a wall that runs down the center of it. But there are small gaps at the foot of the wall that allow small electronic discs to slide back and forth. When Carla activates these, the two heroes and their respective companions must shoot the discs back to the other room, not knowing who they are harming in the process. It's like Saw with Japanese vacuum robots that explode. #3 - Chris's team dies: After aiding Carla, Chris and Piers discover she has an agenda all her own. This revelation comes too late, unfortunately, as she injects all of the team members into Chrysalis enemies. Racked with guilt over what happened that day - or more specifically, the fact that he could not keep his promise to rookie Finn that everyone would make it home in one piece - Chris becomes an alcoholic who wanders from one bar to the next. He completely forgets his role as commander of a BSAA squad until Piers manages to find him and drag him back to the battlefield. #2 - Chris' team dies... again: As if the first time wasn't bad enough, Chris Redfield's team that is sent into China is picked off one by one - this time at the hands of a giant invisible snake. Basically, Capcom took the idea of Yawn from the original Resident Evil, made him much meaner and scarier, and gave him the ability to turn invisible. All of this makes for one of the most intense segments in the entire game, as you never know where the snake is going to pop out from next. #1 - Everything that Simmons does: Though I don't much care for Simmons as a character, I have to admit, his actions are downright nefarious. He tests the C-virus on Helena's sister, coerces her into helping unleash it on the population of Tall Oaks, forces Leon to kill the President of the United States, ends up making Helena fight her sister, sets both Leon and Helena up as prime suspects in unleashing the virus, watches as the Chinese populous descends into chaos, mutates into a number of animal forms before turning into a giant fly and feeding off lesser zombies, before finally kicking the bucket. He's no Albert Wesker, but damn if Simmons didn't try to follow in his footsteps. I cruised through the revamped Victory Road by using a few repels. I found that I didn’t really care to fight a bunch of Gurdurrs during my ascent. As for the actual battles against the members of the Elite Four, they went much more smoothly this time around. 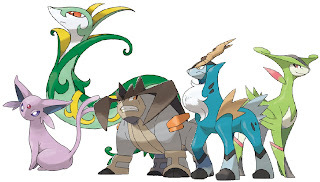 There was certainly still a degree of challenge to them, and I hold firm to my belief that the generation five Elite Four is the best rendition of the series’ “final boss gauntlet run”. But I was much more prepared with my team of Serperior, Genesect, Lucario, Zoroark, Glaceon, and Espeon. Whereas Caitlin proved the most difficult to best in White version, with a team that included bug and dark types she was the easiest to beat this time around. As for the League Champion battle, it was rather interesting. While still intense and challenging, it was also one of the most enjoyable final battles I’ve experienced in a while. The whole fight has an atmosphere of “just plain fun” about it, and after putting an end to the sinister plot that Team Plasma had brewed up, it presents a welcome shift back to the happy overtone the series is known for. But as fun as the endgame was, I still have a fair amount of ground to cover in the post-game. I expect my review for Black version 2/White version 2 to be posted in early November. I’ve arrived at Victory Road, and it is the last thing that stands between me and the conclusion of the main game. It’s been a long road from the brief tutorials and first gym battle in Aspertia City, but it’s certainly been worth it. I was worried that Black 2 would be easier than White version, but the gym battles proved more balanced as a whole – due in part, I think, to the inclusion of Pokémon from past generations. The layout of each gym was cool and - between those and the cutscenes - showed just how much the DS cartridges can handle nearly eight years after the system’s initial release. Choosing Serperior as my starter paid off in the end, with the water and ground-type gyms being significantly easier than in either White version or Soul Silver version. In fact, my whole team is a large break away from what I am used to – bug, steel, grass, and fighting are types that I previously only fought against, and the only dark type I ever got much use out of was my Umbreon in Soul Silver. 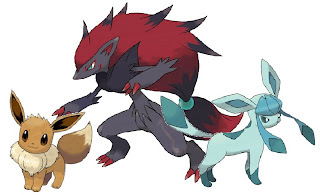 But knowing what the Elite Four has in store for me, I can say that I feel much better prepared this time around than I did while playing White version. I have caught all three of the legendary horse Pokémon, though it was more because the story directed me toward catching them and less because I have any actual intention of using them for this first Elite Four encounter. The story played out very well, and the final few hours fighting Team Plasma were challenging and intense, even with all the healing items on hand. I appreciated the fact that there was honestly no real need to grind throughout the entire game, though I did set aside a couple of hours to boost my Eevee’s happiness and evolve into an Espeon. While Black 2 has not been a wild departure from what I experienced in White version, the few tweaks that have been made here and there are welcome and benefit the game in small ways. 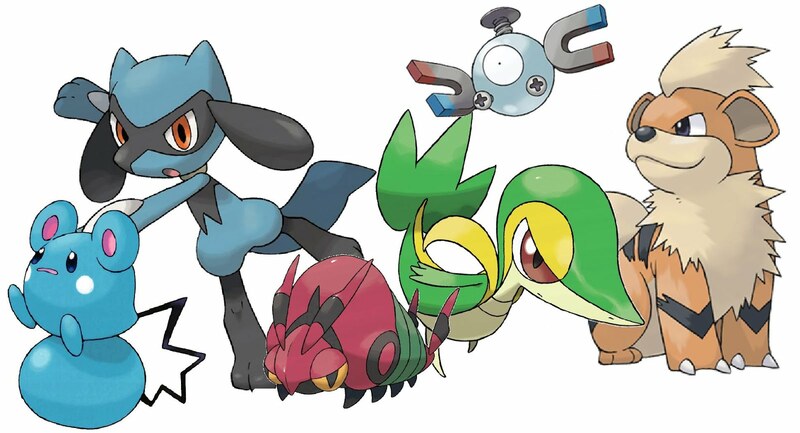 Nintendo has adhered to the simple principle of not trying to fix what isn’t broken, though the new and expanded areas feel just as much a part of the Unova region as everything retained from the first two games. I don’t expect my review to be up before the end of the month, but it should be posted sometime in early November. There’s a lot left to explore in the post-game, and I want to take the time to thoroughly experience that. Also, I would be a liar if I said I wasn’t interested in tracking down some of the legendary Pokémon carried over from previous generations (as well as a certain Shiny Haxorus). 343 Industries has released a new gameplay trailer to prepare for the launch of Halo 4. While previous trailers focused on Master Chief and his development as a character, this one is more concerned with the ancient evil and the role of the Forerunners with regards to the story. Assuming the voice heard is that of The Didact, the Forerunner's most fearsome warrior may play a key role in the events that will soon unfold. Irrational Games has released their latest trailer for Bioshock Infinite, which shows off much of the familiar enemies and gameplay mechanics highlighted in previous promotional material. What sets this one apart from other trailers (aside from the really rocking music that accompanies it) is the fact that we get to see the airborne city of Columbia in times of peace and calm, giving us a little bit better perspective on how things operate there on a daily basis. Spread out over the course of about six months, the events of Resident Evil 6 call veterans Leon S. Kennedy and Chris Redfield back into action to stop a zombie outbreak that threatens multiple fronts. Also caught up in the mess made by Neo-Umbrella is Jake Muller, a mercenary with incredible physical prowess who has only recently discovered his role as son of the late Albert Wesker. The game is divided into three major campaigns, as well as one shorter story revolving around Ada Wong that is unlocked after the others have been completed, much like the side stories of Assignment Ada and Separate Ways in Resident Evil 4. 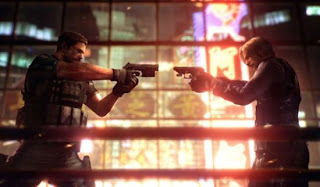 With a return to the familiar viral outbreak scenario instead of Las Plagas or Uruboros, there is a certain familiarity about Resident Evil 6. While the core gameplay builds upon the more recent action-oriented entries into the series, each campaign plays with a distinctly different style in mind. Chris controls fast and furious as he did in Resident Evil 5, and totes quite a full arsenal. While he faces hordes of the tactical J'avo (who are infinitely more intelligent than the standard zombie), Chris' campaign is - interestingly enough - arguably the scariest of the batch. The enemies he goes up against are considerably stronger than those the other protagonists face, and some prove highly adaptable - like the Rasklapanje, who can continue fighting even when their torso has been separated from the legs, or tear off their own arms to throw them at Chris' face to block his field of vision. The environment can play just as important a role, when enemies are difficult to see or when trapped in tight quarters with many powerful foes. All of it makes for a very tense experience that does well to balance the action and horror elements. Piers, Chris' second-in-command, is easily the weakest of the three partner characters. He constantly forgets his place and questions Chris' orders time and time again. Conversely, the chunk of Resident Evil 6 centered around Chris presents him in a more genuinely human light than RE5 did during its entire run. When his team was mutated by the C-Virus in eastern Europe, Chris blamed himself for their deaths and his inability to keep a promise to rookie Finn. He represses all memory of the incident and wanders the country in a drunken stupor until Piers recovers him. As Chris regains his memories, he begins to travel down a dark path of vengeance, and a whole new side of him is presented. It's an interesting look at the concept of man being the darkest beast of them all that the series hasn't really touched on outside the boundaries of evil mastermind villains of yesteryear. While the President of the United States is visiting Ivy University, he is infected by a C-Virus outbreak. Faced with no other option, Leon shoots him and is informed by one Helena Harper that she may have some valuable information for him regarding the cause of the local outbreak. Leon has a handful of nicely varied weapons that he collects over the course of his campaign, and the college town surrounding Ivy University is an obvious throwback to the events of Raccoon City. For the first time in the series history, the chaos erupts before your very eyes as cars spin out of control, motorcycles crash, and people abandon their loved ones as zombies spread out in every direction. Presenting all of this as scripted in-game events as opposed to cutscenes makes the experience all the more immersive. The enemies Leon and Helena face are primarily standard zombies, though there are a number of specialized (and subsequently more-challenging-to-kill) zombies, such as the screamer, the highly-agile and feral bloodshot, the whopper, and the spore-carrying Lepotitsa. Leon's campaign also features a wide variety of boss fights, many of which last for a good portion of a chapter. As a whole, Resident Evil 6 features what is probably the most varied array of enemies the series has ever seen, which will keep you on your toes as you explore the crypt beneath Tall Oaks, an abandoned market in Lanshiang, China, the plane that Leon and Helena board to travel from the former to the latter, and so on. The occasional puzzle element will work its way in, though these are far more prominent in Ada's bonus campaign. 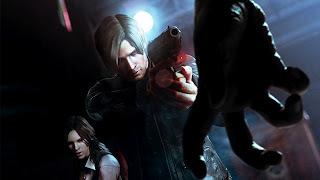 In terms of its gameplay, Leon's campaign controls the most like RE4, though the story elements and classic gothic horror motif evoke memories of RE2 and Resident Evil Zero. As the new kid on the block, Jake is paired with Sherry Birkin, and the two share a unique relationship as children of two of the series' most prominent villains. Jake initially comes across as brash and selfish, informing Sherry that he will go along with her plan to bring him back to the U.S. government to research the C-Virus antibodies in his blood so long as he gets paid a hefty sum of money. While this is an easy arrangement for Sherry to make with her superiors, she tries to convince him that there is more potential than just using his skills as a soldier of fortune. There is a solid progression and development of them individually as well as partners of circumstance. Jake's hand-to-hand combat works well enough, and his advantage in strength allows him to pull of faster (and often more brutal) finishing combos on enemy J'avo. The rest of his arsenal is relatively light, but he controls about equal with Chris and Leon. The environments Jake and Sherry must traverse are a bit less impressive than those that make up the other campaigns. One has the duo searching for key items in the middle of a snowstorm, and the visibility becomes so poor so frequently that reliance on the mini-radar is essential. Another requires them to sneak past the pursuing Ustanak (a nod to RE3's Nemesis) without setting off detectors that take on the form of giant insects, which is not crafted in a particularly intelligent manner. Quick-time events have been molded into more of interactive cutscenes that seamlessly transition from actual gameplay to the cinematics. With regards to their implementation in Jake's campaign, however, they often begin when he and Sherry are confined to a very small area with awkward camera angles and limited mobility, which makes them frustrating interruptions to an otherwise natural flow. Jake does spout off a few cheesy one-liners fitting to his bad boy image. But the writing in Resident Evil 6 is a significant step up from most other entries in the series with regards to dialogue. Though Piers isn't exactly the most likeable, Helena and Sherry play off their respective leads well. The characters that really leave the most to be desired are the major villains. Without spoiling who they are or what their goals are, it is safe to say that the means do not even come close to justifying the end, and that they cannot compare to the evil geniuses of Albert Wesker, William Birkin, James Marcus, etc. At the same time, the web of conspiracy that strings the main characters brings an element of mystery and intrigue to the table. The plot explores the results of the C-Virus as it affects individuals on a more personal level, as well as widespread global panic, with bioterrorism now so frequent an occurrence. Each of the campaigns will intersect with the others at key points, and if you are playing online, there is the potential for four human players to be cooperating in a boss battle or other major plot point. Though there is no real pause option, the game allows you to huddle in a safe location and bring up the options menu on your character's cell phone. The item menu is still accessed in real-time, but has many more slots than in RE5 and is much easier to manage thanks to quick-button commands. Herbs multiply when combined, and heal one block of the health bar a piece. Each character also has a stamina bar, which will be depleted and need to recharge if they perform too many kicks and punches. It isn't a perfect system, but it is an improvement over what Sheva and Chris had to rely on in RE5. Mercenaries mode makes a return, albeit in a limited fashion. Unless you preordered from one of the major retailers offering extra stages as bonus content, your time spent in Mercenaries mode will be limited to three stages. These stages are all inspired by different areas in the three major campaigns, and present solid variation in size and layout. There are also eight playable characters that have their own set of weapons and items, with costume variants that offer even greater freedom in taking on a great number of the infected as the time limit draws closer to zero. Time bonuses and multipliers are spread evenly across any given stage, with the largest of the three - Steel Beast - requiring players to balance moving toward the next bonus with chaining kills. With the ultimate goal of 150 kills in a single round, running into a standstill on an empty stage like in RE5 is highly unlikely. That said, the RE6 version of Mercenaries behaves largely the same as in the past two numbered entries, though enemies are smarter and characters motions are more fluid. Also available post-game is Agent Hunt mode, where players can take on the role of an enemy in another player's game in hopes of hindering their progress. Serpent emblems lay hidden in each campaign, and shooting/collecting these will unlock files relevant to the overarching story or figures of some of the game's major enemies. Also, there are individual skill stores for the different gameplay modes, where players can exchange in-game points for special upgrades. These range from better melee damage to less damage taken from enemies, higher drop rate of ammunition to more time from chaining bonuses in Mercenaries mode, and so on. Ada's bonus campaign is brief, with each individual chapter lasting around a half-hour to forty-five minutes, compared the hour average of the other campaign chapters. Hers is a story meant to tie up some of the loose ends, and the execution is handled well enough. There is a significant emphasis on stealth and puzzle elements early on, with the former being much more direct and less frustrating than Jake and Sherry's run-and-hide from Ustanak routine. The soundtrack is an interesting blend of haunting choir tunes and tense techno battle themes. The lighting effects go a long way in creating the game's many diverse environments, though there are many textures that appear highly dated when viewed up close. 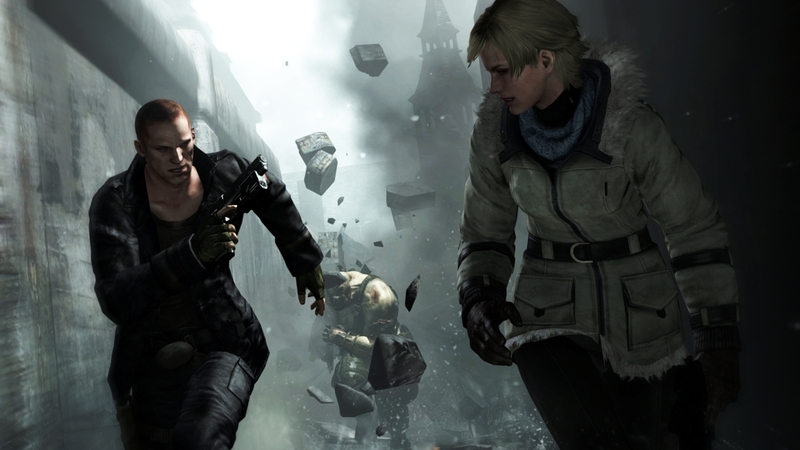 Character models look good, and weather elements lend themselves to creating a much richer and fully-realized set of environments like snowfall over the streets of a partially-destroyed European city and a rainstorm picking up as Leon and Helena seek refuge in a cemetery church not far outside of Tall Oaks. There is a lot to do in Resident Evil 6. The three campaigns make for one of the longest Resident Evil stories woven yet, and the bonus game modes provide plenty of replayability. There are moments where the game stumbles over its experimental nature, but it is largely a successful blend of action and horror, making for a more fast-paced and fluid experience than in RE4 and a more consistent classic horror style than the few jump scares presented in RE5. It may not be exactly what fans were expecting, but there are elements meant to appeal to Resident Evil fans of all kinds, and appears to be Capcom's way of returning to the basic and most successful elements that propelled the series over the years, while simultaneously taking it in a new direction now that the major plotline surrounding Albert Wesker has concluded. With only two weeks left until the release of Halo 4, I thought I would go ahead and explore one part of the game's promotional content that has left me quite curious as to what direction the story will take. Please note that at this time I have not read any of the spoilers that have apparently broken out over the web - I like my gaming experiences to be pure, with the story unfolding as I play it. While I am happy to entertain other theories my readers might have, any spoiler content posted in the comments will be promptly removed. That said, the content of this post deals heavily with content from the Cryptum and Primordium novels of the Forerunner saga, and there may be spoiler content regarding those for anyone who has not read them. The most standout element of the trailers for me has, thus far, been the reference to an ancient evil awakening in Halo 4. While the team at 343 Industries stated very early on that the Forerunners would be central to the story, we know by now that they were anything but evil. As the Forerunner novels indicate, the Didact was the most feared Forerunner warrior among the humans that faced them in the ancient interstellar war. We also know that, despite his dissent toward the Librarian's plan to construct and fire the Halo array, the Didact aided in keeping order to this plan by instilling Bornstellar with his own memories and abilities. In that sense, Bornstellar became a sort of second Didact. Even if the Didact was greatly feared by the ancient humans and their primitive descendants that were relocated to Erde-Tyrene (Earth), the humans in Cryptum and Primordium appear to be more in awe of the Didact than actually fearful of him. Also, at no point during the events of Cryptum does the Didact instigate physical combat, he merely plays self-defense against the Master Builder's forces. In nearly all of the trailers for Halo 4, the Didact's symbol appears (as seen above) - the center of the hexagon may be filled in, but it is otherwise a perfect match. All of this leads me to believe that the Didact will be important to the events of Halo 4. I don't see a way for either the original Didact or Bornstellar to be physically present, unless one of them miraculously survived the firing of the Halo rings. But it is possible that they left messages or clues behind for the Reclaimers (specifically, Spartan 117). The Didact did make mention of those who came before them, the Precursors, and that the Precursors encountered the Flood and managed to contain it before the Forerunners really took their grand role in shaping the future of the galaxy. Though we know practically nothing about the Precursors aside from the fact that their technology was incredibly advanced for its time, the symbol of the Didact could be the link between them and the recurring theme of an "ancient evil". Will we actually see any Precursors in-game? I don't know, but I kind of doubt it. Bungie shrouded the Forerunners in mystery for so many years, and to suddenly throw in a new alien race with little more than a brief mention in Cryptum seems an odd progression. But I think that the presence of the Precursors will be felt throughout the game, assuming my theory is correct. Way back when I started my journal for Pokémon Soul Silver, I stated my intent to raise each and every one of the Eevee evolutions. While I started with Umbreon, I quickly built up a solid line of Eevees, one of which would be evolved into Vaporeon in Soul Silver, and the rest which would be evolved through their respective processes in White version. Thanks to the convenience of being allowed to use the instantaneous infrared trading between White and Black 2, I have moved my Glaceon over to Black 2 and added him to my party. While I won’t deny that Vanillish/Vanilluxe served me well as an ice-type in White version, I would like to better familiarize myself with new Pokémon instead of relying on the same faces as last time around. The same goes for the Eevee I caught in the wild in Black 2, who will be evolved into Espeon relatively soon. I have not actually had an Espeon since the first time I played through the original GBC release of Gold version. My secondary choice was going to be Solosis/Duosion/Reuniclus, but considering those are exclusive to White 2, I don’t much care to go out of my way to track down someone who already owns one and is looking to trade. 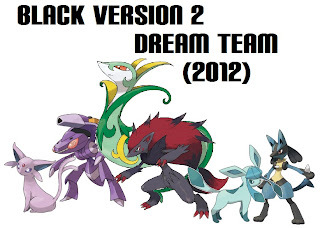 Besides, if I’m raising all these Eevees, I might as well get some use out of them, right? I still caught a few of my mainstays from White version in Black 2 just in case I find my party needs a major change. Zebstrika, Litwick, and Elgyem are all waiting in my PC Box, though I really don’t anticipate using them. In fact, I find it rather strange (though not entirely unwelcome) the fact that I have gotten so far without using a fire type Pokémon. I put Growlithe back in the PC after the first few gym battles, and I’ve found that it actually isn’t terribly difficult to make it the rest of the way without a fire type, though it certainly helps that the game has presented me with so many "free" Pokémon (Zorua/Zoroark, Lucario, the downloadable Genesect). I feel that the gyms have held a much better balance this time around. The first couple were relatively easy to overcome, and none of them have proven exceptionally difficult. But the progression of difficulty has been relatively consistent with each gym presenting a greater number of challengers before the main event with the actual gym leader and smarter tactics from the gym leaders overall. The fact that the game introduces some new areas to Unova is cool. Though I haven’t heard much of Team Plasma in a while, there are rumors floating around Unova of their activities, and I find it hard to believe they won’t make another appearance soon. From the day that Capcom announced Resident Evil 6 would have three separate campaigns, Chris' was the one I found myself least excited to experience. Anyone who read my review of Resident Evil 5 knows that I did not hate the game. Unlike many reviewers, I rather enjoyed RE5, though I recognized it as an action game with horror elements sprinkled here and there, whereas Resident Evil 4 had walked the line between action-horror and survival-horror. While I really enjoyed the way that Resident Evil 5 controlled, the run-and-gun nature of the gameplay had me worried that Chris' campaign would be way too easy. I would not go so far as to say that any one of the campaigns is more difficult than another, but Chris' chapters present a challenge consistent with Leon's and Jake's. While Chris and Piers have more heavy weaponry at their disposal, the game throws far more enemies their way at any given time. Also, despite the fact that these two characters are soldiers, they still feel like two guys dealt the worst hands possible, as their teammates suffer unfortunate deaths as the storyline progresses. The fact that these two take on such a huge responsibility makes for what is surprisingly the scariest of the three campaigns, with bosses that can turn invisible, smarter J'avo than in Jake's campaign, and plenty of Chrysalis enemies. Perhaps the darkest beast of all is man itself, as the story breaks down who Chris Redfield is in a matter of hours better than Resident Evil 5 did in its entire run. The fact that Chris' campaign starts off with a tragic loss leads him down a dark path where he discards his traditional gathered demeanor in favor of a vengeful one. This puts him at odds with second-in-command Piers, a talented sniper who forgets his rank time and time again (and proves to be the only real obnoxious major character in the game, though certainly not as nauseating as past characters like Ramon Salazar from RE4 or Jessica Sherawat from RE Revelations). Though the core gameplay was largely a run-and-gun style carried over from RE5, Chris and Piers did not feel overpowered, as the game does well to provide you with just enough ammo, grenades, and herbs to complete your objectives as long as you play it smart and tactical. Being constantly aware of your environmental surroundings as well as the capabilities of your enemies is key when deciding how to proceed with dispatching them, especially if you want to conserve ammo for an end-level boss encounter. There are a few moments where the camera angle shifts and you are forced to participate in one of the cinematic running sequences that I mentioned in the previous two journal entries. But these are few and far between when compared to Jake's and Leon's campaigns, and really only prove frustrating near the very end. Even though the different wild Pokémon I’ve run into at this point has been relatively limited to a small pool, the types I’ve been able to gather have made for a very well-rounded team. I’ve had a few team members evolve, and added a couple of new Pokémon to my rotation. I am still testing the waters with Zorua and getting a feel for the way he handles. Meanwhile, I swapped out Venipede for Genesect. When I purchased White version, Victini was available for download, though I hardly used him because I wanted my initial playthrough to be exactly as Nintendo intended it to be. With Genesect, however, I am keeping him a few levels lower than the rest of my party to maintain a decent balance. His dual bug and steel types are rather interesting, and his attacks (while severely limited by PP) cover a solid range. The challenge presented by the gym battles is better in Black 2 than in White, in my opinion. Elesa’s team is still frustrating as ever, what with their constant spamming of Volt Switch. But Clay’s gym proved one of the largest yet, and the challengers therein had a nice variety of Pokémon (even if they were all ground types). The World Tournament seems like a really cool idea – almost like a variation of Pokémon Stadium for this handheld game. My first experience with it was quite positive, though I think I will find it even more enjoyable once I have access to battles with gym leaders from regions outside Unova. While the story is still gradually unfolding, it has struck me with a few unexpected twists. While my rival’s motives for tracking down Team Plasma were predictable, the behavior of Team Plasma itself has struck me as very intriguing. I think it’s pretty cool that so many people in Unova mention both the protagonist from Black/White and N. Their presence is felt, even though I haven’t actually seen either one of them in-game yet, and in that regard Black 2 feels like a real sequel to the previous adventure in the Unova region. At present, I am a little over four hours into Pokémon Black version 2. The controls and menu setup are largely unchanged, though there are a few new features that are convenient, like the habitat readout on the Pokédex, which informs you of all the Pokémon that can be encountered in landmark areas in Unova. Nintendo and Game Freak have done a great job in streamlining the experience so far. Instead of spending a lot of time on tutorials, you are given an option to skip past most of these if you are familiar with the previous Black or White versions. Also, you are given Pokéballs before you even leave your hometown, and the first gym leader battle (against Cheren from Black/White) serves more as a benchmark than a full-fledged battle - Cheren only uses two Pokémon, but it is a good idea to grind just a little bit before facing him, which will in turn aid a natural experience progression in the areas that follow (and on to the second gym). That isn't to say that Black 2 is slow-going right out the door - in fact, the introductory events move much more quickly than with its predecessor. The opening credits suggest that N will play an important role in Black 2/White 2, and already the people of Unova have made mention of his actions from two years ago. Team Plasma made a brief debut, and I will be interested to see what has become of them since their defeat in the first two games (odds are they haven't wised up to using more powerful Pokémon than Patrats and Woobats, but whatever). The first two gyms were relatively quick, with the latter's rock-concert venue being something strikingly different from past gyms, and honestly pretty darn cool. The fact that these gyms were host to Normal types and Poison types respectively hopefully indicates a more natural progression in the game's difficulty (the gym battles being among the few complaints I had about Black/White versions). Fire types have traditionally been my go-to starters, and using Oshawott in White version proved a different (though not wildly so) experience. This time around I chose Snivy as my starter in the hopes that it provides me with a slightly higher degree of challenge than with past Pokémon games. Honestly, I've hardly ever used any Grass types before - though Bug and Poison types are not completely foreign to me, I anticipate using a Grass type will take some getting used to. As for the rest of my party, I've been capitalizing on the fact that there are so many Pokémon from previous generations now available for use in Unova. As I mentioned in some of my previous postings, I have never played any of the core games from Generation III or IV (i.e. - Ruby, Sapphire, Emerald, Diamond, Pearl, Platinum), it is nice to have access to Pokémon like Riolu and Azurill so early on. 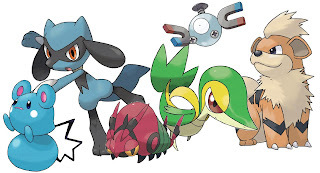 For the most part, the Pokémon currently in my party are single element types, which makes for a substantially different experience than I had anticipated when compared to all the dual types I had in my party throughout most of White version. To be honest, it's kind of like a throwback to my experience with Soul Silver. I am going to try my hardest to avoid overlap from my party members in White version - I may train another Chandelure, and I do intend to catch Zekrom by the endgame, but I want the rest of my part to be different than the last time around. One of the main themes that Capcom stated they wanted to come across in Jake’s campaign prior to the release of Resident Evil 6 was the sense of being stalked by the Ustanak as mirroring Nemesis from Resident Evil 3. While Ustanak is prominent in the first couple of chapters of RE6, those same chapters control like a curious combination of Resident Evil 4 and the older entries in the series. The European town that Jake and Sherry run through as they try to escape the Ustanak and J’avo is reminiscent of RE4 both in terms of aesthetics and layout. While the two aid Chris Redfield and company in fighting a giant B.O.W. that bears some resemblance to the El Gigante, they also spend plenty of time solving environmental puzzles, riding vehicles, and sneaking around sensor bugs that Ustanak sets up within an ice cavern. Being children of two of the most important Resident Evil villains, Jake and Sherry have a unique and genuinely interesting relationship. Despite Capcom’s tendency in recent years to create or recreate female leads that are weak and whiny, Sherry holds her own alongside bad boy Jake as one of the strongest lead characters in RE6. To that end, I think Jake and Sherry’s storyline could prove the best of three, though Leon and Helena’s is certainly more dark and creepy. Going back to the gameplay, the brief stealth sections are not particularly well-handled, and the Ustanak is more of a constant annoyance than a full-fledged villain. The latter element would be fine, if the campaign did much of anything to explore the individuals who command Ustanak, but in the end Jake and Sherry’s story feels the most far-removed from the main storyline. Jake controls more or less like the other characters, though his kung-fu fighting and wrestling suplexes give him a distinct leg up in hand-to-hand combat. The enemies do not feel quite as varied as in Leon’s campaign, though there is still a solid variety presented, most of them being B.O.W.s and J’avo as opposed to traditional zombies. There is one level where Jake and Sherry must collect a series of key items scattered about a mountainside in the middle of a snowstorm. There are quite a few enemies littered about, and the entire scenario is pretty tense and creepy. However, it is also easy to find yourself lost, and the mini-map in the top corner of the screen practically becomes a necessity. Perhaps the most poorly designed gameplay element of Jake’s campaign are the running sequences that border between traditional gameplay and quick-time events. I wasn’t much a fan of the way these were implemented in Leon’s campaign, but they are usually a mess in Jake’s campaign. Though there are only a handful of these running sequences, the level designs always grant you minimal space and Sherry tends to get in the way, slowing you down and sending you to a premature death within seconds. Don’t get me wrong – Jake’s campaign was fun, and the story was really cool, even though Leon’s proved superior as a whole. Even though Jake shoots off his fair share of cliché bad boy phrases, they are nowhere near as silly as some of the dialogue in the older entries. As a whole, Jake’s campaign plays pretty solid, despite a few hiccups along the way. The hand-to-hand combat works better than I expected, and there is a nice variety presented in the level designs. There is a large gap of time that the story skips over, and even though it makes sense with the overarching plot, it feels like another chapter could have been added to Jake’s campaign. 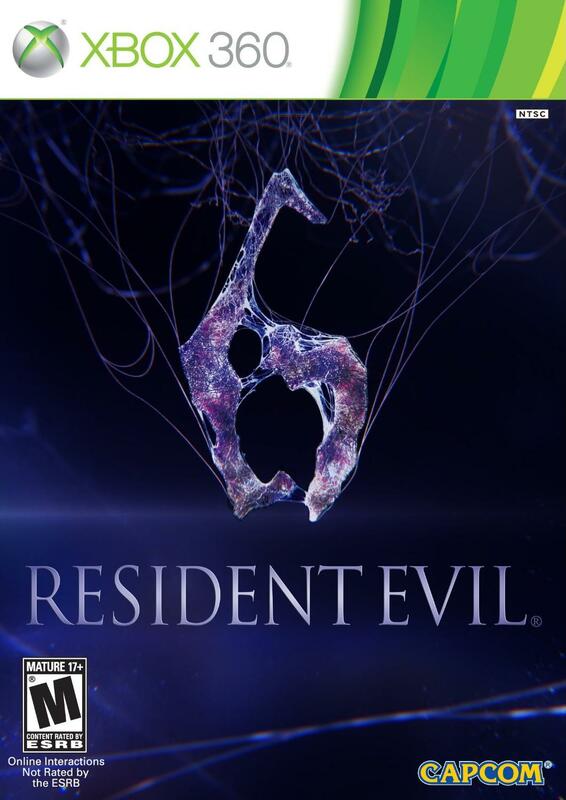 In a similar vein to my Pokémon Black/White and Heart Gold/Soul Silver journals, I will be posting a few short entries on the Resident Evil 6 campaign before I post my review (which will cover both the campaign, Agent Hunt and Mercenaries Mode, etc.) This is both to help better gather my thoughts on the game as well as provide my (spoiler-free) experience with the three main campaigns. As of today, I have completed Leon's storyline and plan to tackle the other two later this weekend and into the following week, as I can't imagine that the game will take me much longer than that to fully take in (also, Pokémon Black 2/White 2 hit store shelves this Sunday, so I will be spending the better portion of this Fall with my DS). Leon's campaign is in many ways a throwback to previous entries in the series. 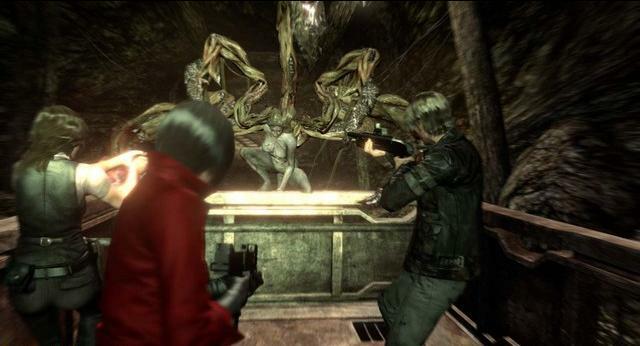 It does well to blend the action elements of Resident Evil 4 and Resident Evil 5, while retaining the classic horror thematic of the earliest series on the Resident Evil timeline (i.e. - Resident Evil Zero, Resident Evil 2). There are some direct nods, such as a church that bears a striking resemblance to the Los Illuminados' place of worship in RE4, as well as familiar settings like Tall Oaks, a small American college town that becomes engulfed in chaos following a viral outbreak. The environments are nicely varied, and include such memorable settings as ancient underground ruins, the classrooms of Ivy University, and Chinese market streets. The lighting effects are fantastic and each distinct area is wonderfully realized. Unfortunately, some of the textures look highly dated up close, and blood animations are subpar. Conversely, there are a lot of different zombie types that Leon and Helena take on, including the classic infected, reanimated skeletal remains, screamers, spore carriers, and acid spitters. Probably the best of the bunch are zombies and B.O.W.s seemingly inspired by RE4's Regenerators. The first are zombies that shed their rotting flesh and replace it with a hard glassy shell, leaving their exposed chest as their sole weak point. They are very fast and can lunge at Leon from a fair distance. The second appears to be a B.O.W. 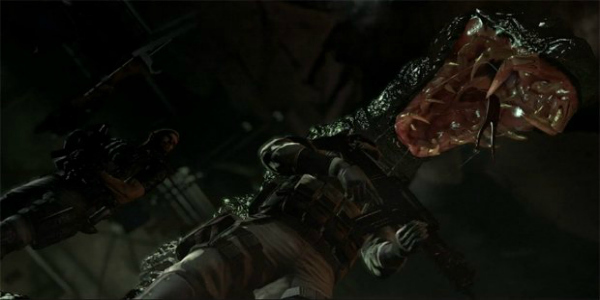 with black leathery skin (not unlike Ridley Scott's Alien) that can sever at the torso to strike at Leon's legs, as well as bite off its arms and throw them, allowing them to run about on their fingers and blind the protagonist's field of vision. These enemies have the ability to regenerate, and are both fast and smart, despite having a glaring weak point once the chest and legs have been separated. While Leon's story begins with him investigating Tall Oaks for signs of where the outbreak began, he crosses paths with the other two protagonists and their partners after traveling to China. Leon also encounters Ada Wong a few times along the way, and their past becomes a prominent plot point during later chapters. While both RE4 and RE5 had human NPCs present, this is the first game to feature citizens in panic in-game, bringing about a better realization of the terror and gravity of the situation at hand. While RE5 posed the question of what might happen if bioterrorism spread across an entire country, RE6 looks at the potential for a worldwide outbreak. The menu system is not perfect, but it is a decent improvement over the one used in RE5. There is still a cap on the number of items Leon can carry, but it is not a meager nine slots. Health is now divided into sections of a single bar, and being hit by an enemy will deplete one section of that bar. Leon can mix herbs to quickly multiply the number of herbs on hand, and can use these to either heal a single bar at a time or the whole bar (by tapping the bumper repeatedly to use up the appropriate amount). 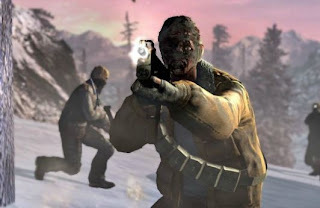 Quick action sequences are not so intrusive as in RE4 or RE5, and are instead blended in as a sort of interactive movie segment that maintains the game's fluidity. Leon's campaign features some stellar boss fights, as well as a one or two that seem a tad cheesy in the midst of an otherwise solid action-horror story. The main villain of Leon's campaign, however, is rather one-dimensional and his goals seem frankly illogical when compared to the brilliant madmen of yesteryear (Wesker, Marcus, etc.) I have only scratched the surface of Mercenaries mode, and I have yet to touch either Jake's or Chris' campaign. You can expect to see journal entries regarding those within the coming week or two.